On show at Maison et Objet, Magma is all about contrast. Smooth against rough. Light against dark. Angled lines against soft curves. Much like its namesake, the Magma series of table lamps appear as if they have emerged from deep within the earth’s centre, topped with a light touch of illumination. French designer Ferréol Babin has brought his signature hands-on approach to a sculptural series of table lamps. The ceramic base of every Magma lamp is liberally applied with fat lava glaze, each piece reacting differently during the firing process. The result is a textured piece of raw earth, strong and stable. Delicately sitting on top, a handblown glass form appears to almost float. The warm illumination highlights the curved glass form and provides a visual counterpoint to the angular base below. 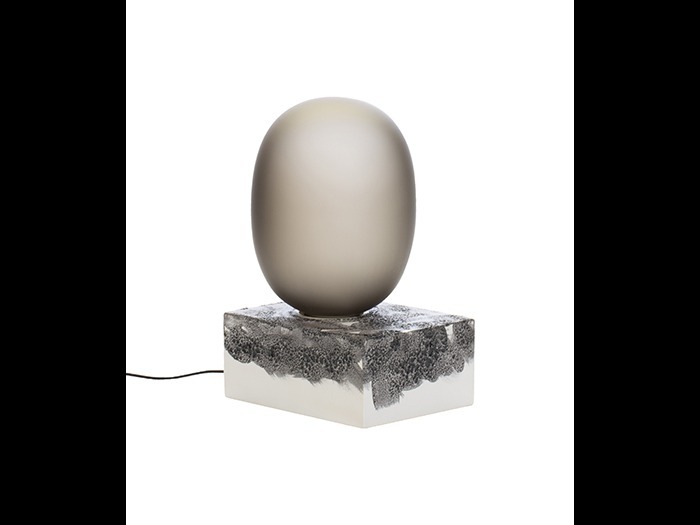 Available in a high or low version, with a vertical or horizontal oblong shaped glass globe, the Magma series expresses a simple sculptural quality. Further personalise your tablescape companion with the option of a white or black fat lava glazed ceramic base, or a frosted white or smoked handblown glass globe.